Prior to the Internet and its potential for enabling networking and exchange of information between individuals, Mail Art provided a direct manner for some poets to distribute their ideas through a rarefied form. “Mail art—along with the synonymous terms Postal art and Correspondence art—refers to small-scale works that utilize the mail as a distribution system. These terms have also come to refer to related formats, including artist-designed “postage stamps,” postcards, and even impressions from rubber stamps”. The rise of Mail Art in the USA during the 1950s provided a forum for a number of unusual visual and poetic mediums. One of these was Concrete Poetry which emphasized a poetic through concrete forms derived from letters of the alphabet. 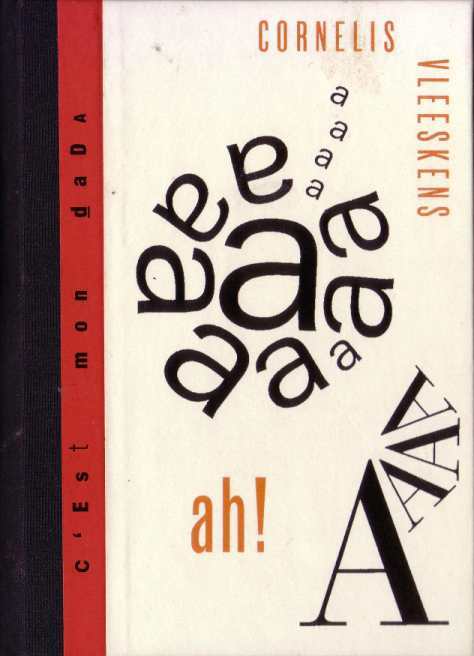 The use of the alphabet as a potent visual medium can be traced to medieval times, however, the international Concrete Poetry movement may be said to have began with Stéphane Mallarmé’s (1897) Un Coup de Dés Jamais N’abolira Le Hasard (A throw of the dice will never abolish chance) – a typographic poem that challenged established presentations of texts in books and ways of seeing and reading texts. The unusual use of typography, page space, letter forms and chance play of meaning initiated by Mallarmé continued in the early twentieth century with the Fluxus Group, Dada telegraphy, Futurists correspondence and in particular Marcel Duchamp’s Rendez-vous du Dimanche 6 fevrier 1916 ~ a set of postcards, which he posted to other artists. John Cage’s mesostic texts, in which he used the throw of a dice to determine font types, also exerted an influence on the presentation of poems and methodology of production. Poems were produced on paper by artists in small editions or photocopied so that they could be distributed inexpensively through the postal system. 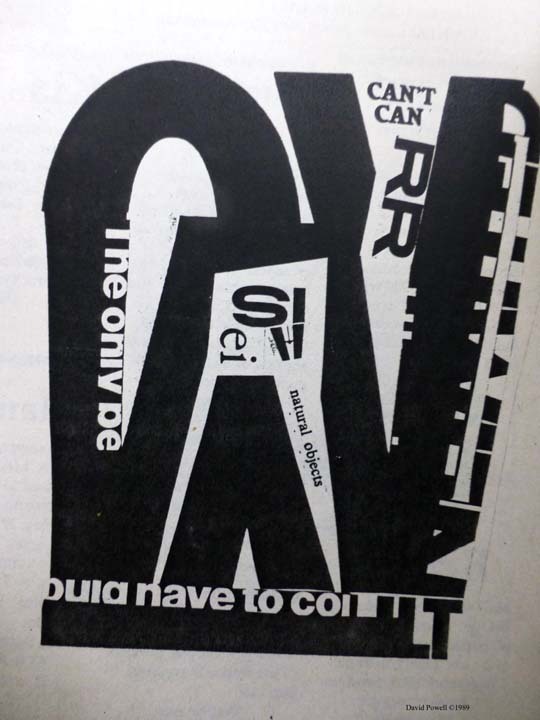 Although this activity had been prevalent internationally since the first decade of the twentieth century, Concrete Poetry began in Australia in the 1960s. 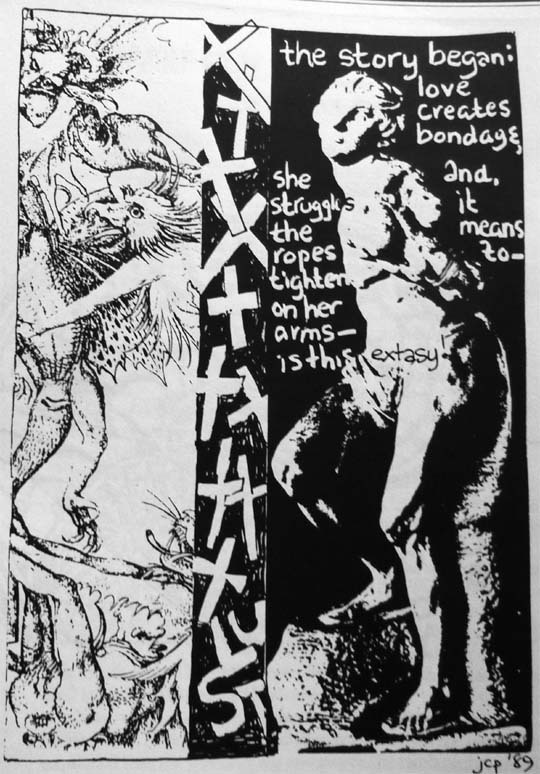 Whilst Concrete Poetry continued, there was a departure from its traditional forms in the early 1980s by Visual Poets who included collaged images as well as text in their poems. This use of collage created unusual juxtapositions and meanings. Most, if not all Concrete and Visual poets in Australia were also Mail Artists since they posted their poems to others around the world, often contributing to a call for works sent out by international small press Concrete and Visual Poetry magazines. Concrete and visual poets in Melbourne have produced a number of small print publications since the 1970s. ΠO produced Fitzroy No. 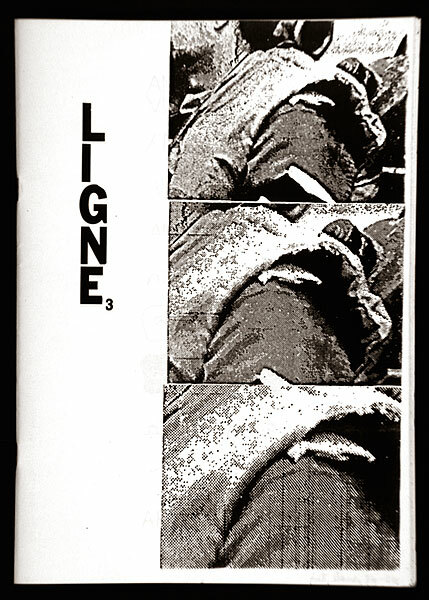 4 in the 1970s and David Powell and Pete Spence produced Ligne magazine in the 1980s. Cerebral Shorts (Charles Roberts, now Charles Strebor) produced Convolusions: Of the Irregular Brain Post in the late 80s and early 90s. Before he passed away, Jas Duke worked closely with Peter Lysiottis to produce a small book, which is still in Peter’s possession. Tony Figalo and Pete Spence published Axle Concrete Poetry, a small press magazine in Richmond, Victoria, which included concrete and visual poems from Australian and international artists for nearly two decades. Collective Effort Press produced Missing Form: concrete, visual and experimental poems in 1981 and in the same year a facsimile edition of Christopher Brennan’s hand written Musicopoematographoscopes was published by Hale and Iremonger. Several major exhibitions of concrete and visual poetry have been staged since the late nineteen eighties. In 1987 a group of visual poets (Julie Clarke, David Powell, Pete Spence, Thalia, Alex Selenitsch, Peter Murphy) exhibited their work in JustWot?, at Artist Space Gallery, Park Street, Fitzroy. Barry Reid at Heide Gallery was the curator of Words on Walls: a survey of contemporary visual poetry in 1989. Pete Spence was the curator of an International Mail Art Show at The Writers Centre in Melbourne in 1990 ~ Visual Poetry Outdoor Show at St. Kilda Festival in 1990 ~ an exhibition at Linden Gallery, St. Kilda in 1991 ~ Visual and Concrete Poetry at Trades Hall, Melbourne as well as Mallarme: Visual Poetry in 1998. Raimondo Cortese (playwright) was the curator of the Third International Visual Poetry Exhibition in 1992 and Griffith University in Queensland organized Essence: International Networking Culture in 1995. Dale Chapman curated Tongue – Artists using text, at Spencer Street Platform Project, in Melbourne in 1992. Linda Michael with Peter Tyndall curated Word: artists explore the power of the single word at the Museum of Contemporary Art, Sydney in 1999. Works produced by concrete and visual poets initially stood outside traditional poetry and ‘High Art’ expectations; however the techniques have influenced the development of text-based art adopted by many international and Australian artists. Indeed it has become interdisciplinary practice for the past five decades. Poems produced in small format, were originally intended to be posted and maintained a sense of intimacy. Australian writers/artists I am aware of who have been active visual poets over he last decade include: Bev Aisbett, Javant Biarujia, Mike Brown, Alex Danko, Jas Duke, Tony Figalo, Peter Lysiottis, Finola Morehead, Peter Murphy, David Powell, Leonie and Frank Osowski, ΠO, Rose Nolan, Alex Selenitsch, Pete Spence, Stelarc, thalia. Richard Tipping, Peter Tindall, Cornelius Vleeskins, Nicholas Zurbrugg, and myself. Dr Julie Clarke is a writer and exhibiting artist with a PhD in Cinema Studies from the University of Melbourne. She has exhibited her artwork in Australia and has had her visual poems published in Australia, Italy, Egypt and Russia. Her academic writing and poetic prose has been published widely in Australia and Internationally. She has been the primary author of the Anything But Human blog (http://juliejoyclarke.blogspot.com.au/), which has had over 150,000 page views since 2009. This entry was posted in Issue 8, Julie Clarke and tagged Alex Danko, Alex Selenitsch, Barry Reid, Bev Aisbett, Charles Roberts, Charles Strebor, Concrete Poetry, Cornelius Vleeskins, David Powell, Finola Morehead, ΠO, Jas Duke, Javant Biarujia, Mail Art, Mike Brown, Nicholas Zurbrugg, Pete Spence, Peter Lysiottis, Peter Murphy, Peter Tindall, poetry movement, Richard Tipping, Rose Nolan, Thalia, Tony Figalo, Visual Poetry by Mark Roberts. Bookmark the permalink.